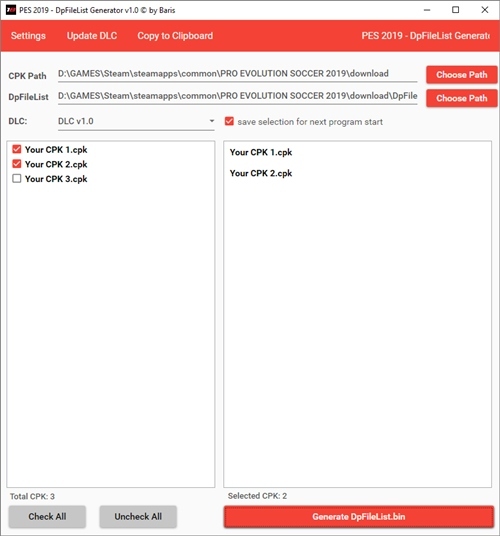 - improved automatic update of dlc.csv (even periodically every week or every two weeks): no need to manually update your dlc.csv or re-download this tool again! Necesitas tener instalado .NET Framework 4.5 para que funcione. At top of the generated DpFileList.bin the cpk file with the lowest priorty is arranged. The “dlc.csv has to be in the “DpFileListGeneratorData” folder, please don’t change the data structure, otherwise the tool will not find the csv file. Just download the file, extract and run it. 4. What is the maximum amount of CPKs that can be added? 47 CPK files can be added.